Review by Frank Barbian d.o.p. It all started at AFC’s (Association Française des directeurs de la photographie cinématographique) 2016 edition of Micro-Salon, the French Society of Cinematographers’ equipment show in the historical halls of the former Pathé Studios, now host to the national film-school La FEMIS in Paris. When in normal use, the studios are used by a small group of carefully selected students but once a year, the floors and studios are packed with French cinematographers and camera operators in addition to European visitors and manufacturers. It was there when having a look at the new Zeiss Compact Zooms that product manager Christophe Casenave suggested to test them. This was a very kind proposal, but all the technical testings, filming charts and exposure series was largely already done and I wanted to try them out practically therefore I took my time and waited for an opportunity. A few weeks later I was invited by the AFC to assist with a presentation screening of the new Varicam LT, held by Panasonic European VariCam Specialist Luc Bara. What I saw intrigued me: a professional and lightweight camera with a dual-native sensitivity of 800 and 5000 ASA camera, and a picture quality that stood firm on the large screen of a 4K projection. I started to configure my test shoot at a location in Paris with appropriate urban light for a well-lit exterior/night sequence; different perspectives offering a wide depth for long focal range shots and multiple light sources in a far distance to avoid black holes within the image whilst generating bokeh effect in the out of focus areas of the image. One would expect to find a multitude of places that meets each of these requests, but there are in fact not so many because of a common theme found in France: sodium vapour lamps everywhere. Most of the urban light on my possible locations was deeply orange tinted, so these were not the best colour conditions for a test shoot. Finally I found the ideal place on Pont des Arts over the Seine River with white lantern light on both sides of my scene, wide perspectives over the river, lit monuments and far light sources all around. For some time, I wondered what to shoot since I didn’t want to write a fictional scene whilst also wanting to keep the production crew very small. Through my love for Argentinean tango, I had the chance to work and be taught by Irene Moraglio and Patrice Messirel, who were the 2016 French Champions, and so we simply worked on the choreography to film the beauty of their dance. In addition, it covered everything that I needed for testing: faces, bodies in movement, structured tissues, coloured costumes and a large range of different possible framings. The most important thing that I wanted to acknowledge was to see how this system worked on practically whilst shooting both exterior and nights shots as well as its handling, working speed, menu comfort, recording, accessories and so on. Is it really a professional camera when compared to the likes of the Alexa, the F55 or the Red? The second element I wanted to test was the exposure levels and images quality. What would the 5000 ASA-generated grain look like on a large screen? What about the two main codecs featured in the camera – Panasonic’s custom AVC-Intra 4:2:2 4K and ProRes 4:4:4 HD? What about slow motion, with the higher frame speeds of 60fps or more on the Varicam LT requiring a crop into the chip from Super 35mm to Super 16mm in addition to a more compressed codec, therefore I decided to have a closer look at shots at 100fps. In cooperation with Paris-based rental house Plani Presse we completed some preliminary testing and put together the accessories. We had roughly four hours between midnight and true darkness when the lighting on the monuments in Paris would shut down. I was lucky enough to have a cloudy sky on the day of the test – not only because the clouds darkened daylight earlier and thus prevent the sky from tinting in blue, but also because the covered sky was lit by the city-lights and was therefore a little structured. In the final images, this sky is an ideal area to judge the amount of grain/noise of a given ISO-index. 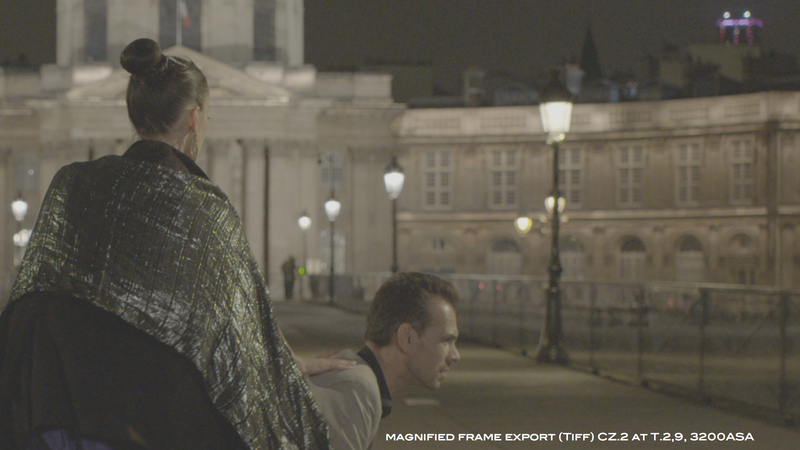 After the shoot and edit, we went to colour-grading which was offered by CineMage – a partner of the AFC – and was operated in 4K onscreen by Jérôme Valdire on a DaVinci. We were astonished at the level to which the amount of grain/noise was reduced from the moment we started grading the images captured in V-Log. During the shoot, the flat green-greyish images on the monitor seemed rather frightening at 5000 ISO, so we went to ISO 3200 for some shots to compare. However, when Jérôme graded them the grain did not disappear, but instead diminished and started to integrate within the image to create this charming structure. Sure, it depends on the type of film you’re shooting, the creative decisions that are taken and whether or not you will accept this kind of grain-structure at 5000 ISA. For the kind of films that I tested for with the Varicam LT, it adds an interesting style and I have to admit that I didn’t even add anything to reduce grain such as over-exposing for example. We didn’t even use any noise-filter in post. Another interesting point was to compare the codecs by grading two wide shots – one recorded at 4K AVC-Intra 4:2:2, the other at HD ProRes 4:4:4. We projected both shots onto a 4 metre screen and we were astonished about the little difference in picture quality concerning resolution, sharpness and contrast. Even by magnifying we could merely see any difference. 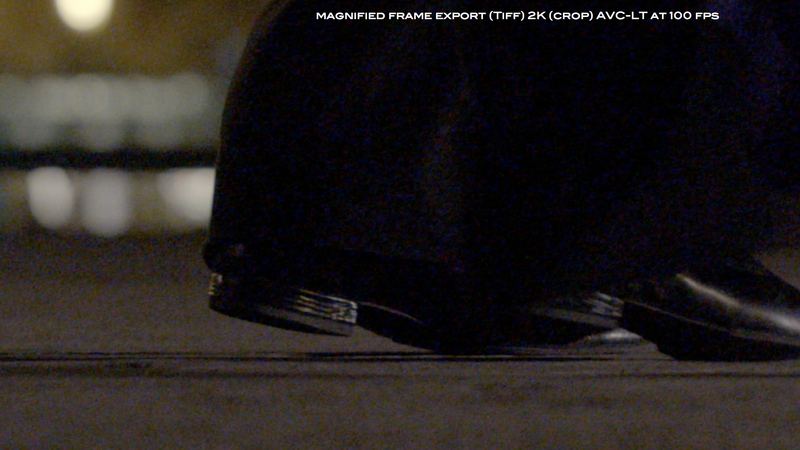 The ProRes file has a slightly steeper gamma-curve, whilst the AVC-Intra file has a little less contrast. The main difference between both codecs is that the AVC-Intra codec is more comfortable to grade and allows more deviance from the original settings whilst maintaining a greater consistency in the image quality. 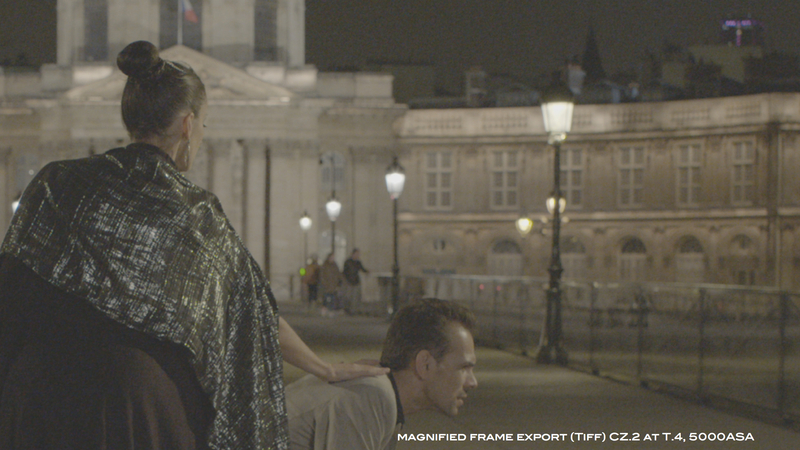 Since the VariCam sensor has a 17:9 aspect ratio, shooting on ProRes HD means that you have to zoom in by 5% in order to recover the same ratio when mixing these formats in one clip. When shooting in slow-motion above 60fps, deterioration in the image quality can be seen. Whilst the Varicam LT full-sensor and AVC-Intra recording at up to 60fps, higher frame rates can only be generated by cropping the frame and recording in a lighter, more compressed AVC-LT codec which provides slow-motion at up to 120fps. Testing this function at 100fps, we observed during the grade that the codec generates colour clusters in the shadow details – however, this is no wonder due to the tremendous amount of data flow on these high frequencies and once this was integrated in the editing, the images seamlessly integrated. In terms of the ergonomics of the camera, we found out that the interchangeable lens-mount between PL and EF is not very comfortable when shooting at an exterior location since the tiny locking-screws fall out easily, particularly as one of the screwholes is merely accessible by the screw-driver as it is blocked by the filter wheel. Despite this, changing the lens mount may be an option for interior or studio locations and having this feature is great for any rental house. A main advantage of the Varicam LT is its small and compact light-weight body, which weight just 2.7kg body only, and can therefore be used on a gimbal system. 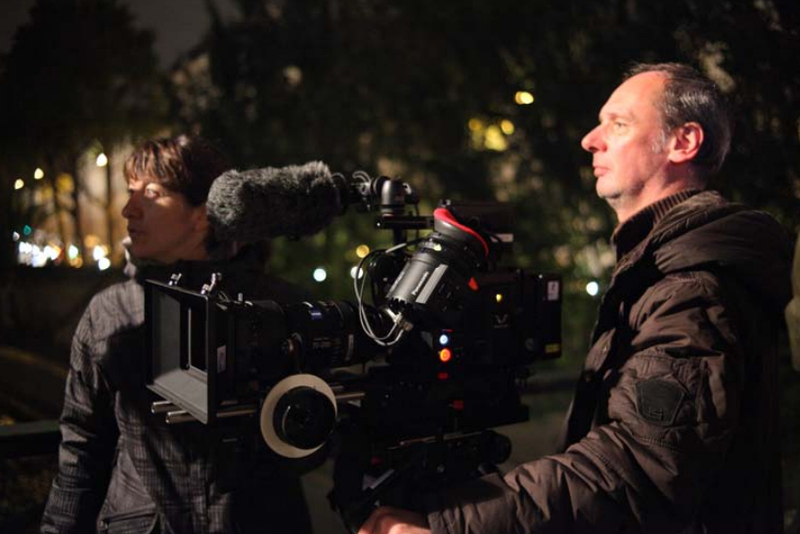 Starting up rapidly, the camera-system is controllable via the now well-known menu-interface that is used on many professional cameras such as the Alexa and the F55. This is good news for camera operators – however, the best news is that Panasonic also put on a marvellous viewfinder on the Varicam LT which provides a clear and sharp image with an excellent contrast reproduction onto a 0.7-type OLED 1280x720x3 (RGB) pixel panel, with a false colour function based on V-Log and an anamorphic desqueeze. The only weak point in my opinion is the eye-sensor which permits the extinction of the OLED when the operator disconnects. When coming back to the eyepiece, the viewfinder takes a bit too much time to switch on again and in fast shooting conditions may be a bit annoying – however, I’m sure that this will soon be fixed by Panasonic in further software upgrades. In summary of the Varicam LT, for our particular requirements in which we tested the camera for it is a very interesting option with a charming, cinematic image-style that offers speed, versatility and a simplified post-production via a lighter and simplified data-flow that doesn’t compromise on picture quality.